Before 1865 New York City’s fire fighting depended on an disorganized collection of volunteer companies. When a fire broke out, young men in the neighborhood called “laddies” would scramble to the fire house. Nearby fire houses would vie with one another to arrive at the fire first, or to become more skilled at extinguishing it. The volunteer groups gained a reputation as rowdy, boisterous gangs whose fire houses were essentially social clubs. The devastating fire that destroyed Barnum’s Museum in 1865 along with pressure on the State Assembly by reformers resulted in the Act of 1865 that coupled Brooklyn and New York with a paid, united “Metropolitan District” fire department. It was about this time that a new fire house was constructed at No. 323 West 21st Street in the burgeoning neighborhood that only thirty years earlier had still been part of Clement Moore’s family estate, Chelsea. The red brick, four-story building pretended to be nothing more than it was: a firehouse. Trimmed in brownstone, the central opening was wide enough to accommodate a new horse-drawn steam pumper engine. It would seem that by 1875 the fire house had already been given over to other uses. William Livingston was a carriage driver who was living here on May 16 of that year. Livingston was arrested after the horse and carriage he was driving ran over and killed 9-year old Jacob Levi. Emma K. Beam became owner of the building in 1908 and continued leasing out the upstairs rooms. The American Art Directory listed John Yeats as living here in 1918. Yeats was perhaps the first tenant in the building with an artistic bent; he would certainly not be the last. Anna Gerard sought refuge here in 1921 to escape her husband, William, who still lived in their furnished room down the block. The pregnant woman had filed for divorce charging cruel and inhuman treatment. Gerard, who was a worker at the Art Printing Company in Manhattan, accused her of abandonment and added that he never struck his wife. It would seem Gerard had some control issues. In 1929 Emma Beam sold the building to “an investor who plans to alter the structure,” according to The New York Times. Those alterations did not happen until 6 years later, according to Building Department records, when the firehouse was converted to a “garage for more than five autos” with offices on the second floor; and one apartment each on the upper floors. It was most likely at this time that the architectural detailing of the brownstone lintels and main entrance surround were shaved flat—a common practice in an age that viewed Victorian ornamentation as grossly passé. Although the building plans called for offices on the second floor, they never materialized. In 1933 dancer Franziska Marie Boas had established her studio and “Boas School” here on the second floor and stayed on for nearly two decades. Boas lived here with her friend, Jan Gray, and a big, shaggy sheepdog, “Name.” The edgy artist staged avante garde performances like the “by invitation only” program of dances and percussion music listed in The New York Times on June 8, 1941. Noted as “assisting artists” were dancer Valerie Bettis, and “director of Chinese music,” Danny Seid. Franziska Boas confronted racism in the arts with multiracial dance groups and by opening her classes to all races. She constructed a proscenium arch in the West 21st Street space for her shows and would sometimes invite artists to sketch the improvisational dancers. The room was decorated with ethnic instruments from around the world collected by her anthropologist father, Franz Boas. In the meantime, struggling artists Andy Warhol and Philip Pearlstein were sharing a subleased, vermin-infested apartment at Avenue A and St. Mark’s Place in the East Village. When the lease was up, they searched the New York Times classifieds and found someone who wanted to share her space. It was dancer Franziska Boas. Warhol and Pearlstein managed to pay their portion of the rent to Boas; however she was not passing it on to the landlord. In March 1950 all four tenants and the big shaggy dog were evicted. In 1955 the building saw its first change in ownership since 1929. At the time of the sale The Times noted “a store” on the ground floor of the apartment building. 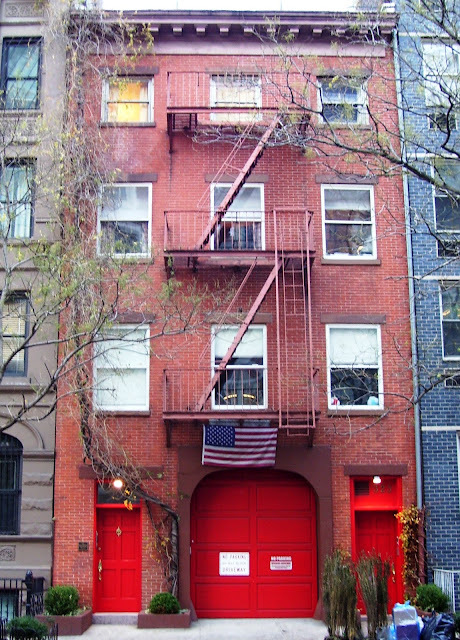 As the Chelsea neighborhood around it changed, the red brick firehouse did as well. In 1998 it was converted to luxury housing with a single-car garage in the former steam engine bay, and three apartments. The high-end conversion landed the interiors of the duplex apartment (extending from part of the ground floor through to the second) in a 1999 issue of Architectural Digest. From firehouse to luxury apartments, with some cockroaches and bus parts thrown in between, the mid-Victorian building at No. 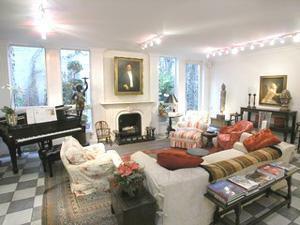 323 West 21st Street has a rich and varied history.